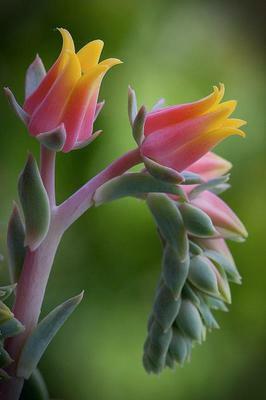 Hi, I would like to buy this plant, but I think it is incorrectly identified and I am having a hard time finding pictures of Echeveria in bloom that match. It is identified as echeveria derenbergii, which I think has a more yellow/orange flower. I found another possible answer to my question...echeveria "Dr. Butterfield"? The Dr. Butterfield and albicans are the closest I've seen so far. It's hard because there are so many echeveria but not a lot of pictures of the flowers. Hi Stephanie, I know what you mean about the identification of these great plants! It's like a detective story sometimes, and there is so much mis-information out there even with supposedly reputable nurseries and growers selling mis-named plants. My vote is for the latter!